Kelly Thompson has taken the comic industry by storm over the last few years with her take on Jem and the Holograms for IDW Publishing, Heart in a Box for Dark Horse, Mega Princess for BOOM! Studios and her run on A-Force and Hawkeye for Marvel. 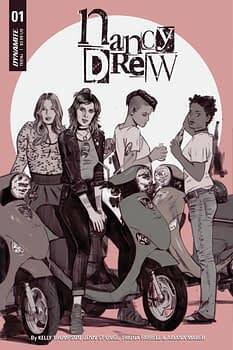 And now she is teaming with Jenn St-Onge for a new run on the classic teen detective series Nancy Drew for Dynamite Entertainment. I had a chance to talk to the writer about taking on 88-year-old sleuth. 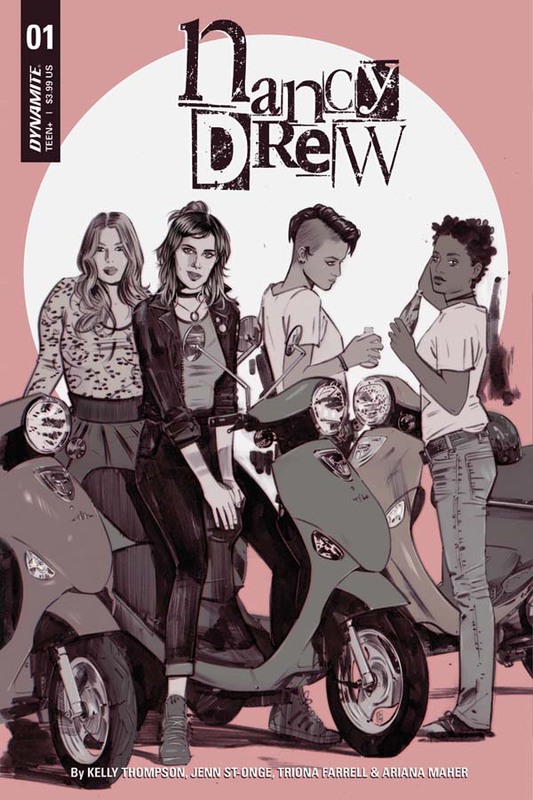 DAN WICKLINE: You’re upcoming project for Dynamite is a new Nancy Drew series with Jenn St-Onge. What does the character of Nancy Drew mean to you, and why do you think she is so popular almost 90 years since her original creation? KELLY THOMPSON: I think Nancy Drew is at once inspirational and relatable, which can be a hard mix to hit in a character, but Nancy straddles it quite gracefully I think. Her strengths make her incredibly inspirational – we as readers aspire to be more like her – smarter, more driven, more successful, to do the right thing, to stand up for what you believe in, and to just be…. better. But her flaws are things we recognize in ourselves – and they’re the things that ground her for us as readers and make her relatable and human. Her obsessive personality, her inability to connect to people on a deeper level, her single-mindedness, her cavalier use of people/their skills/knowledge to achieve her goals – even if good intentioned – can be cold. We see ourselves in her, but also who we want to be. It’s intoxicating. DW: The character has had to grow and change over time, but there are key things about the character that has always been consistent. What are the elements that must exist in any good Nancy Drew story, and how are you molding those into your take on the character? KT: I think Nancy must always be smart and particularly resourceful and fiercely independent, especially for her age. She must always be essentially good; a real hero always trying to do good. But she must also always hunger for adventure and crime solving – almost to an obsessive degree. It’s not something she can just turn off – it’s something she NEEDS to do. And all of that translates beautifully to a modern heroine, which is one of the reasons she’s so timeless and iconic, so you just have to update some of the specs and details and I think you’re ready to go. DW: What can you tell us about the new series? How long is it planned for, and are we looking at one big mystery or a series of mysteries over the run? What is it that gets Nancy involved in the story in the first place? KT: To start we’re doing a five-issue mini-series that will center on one case — which will be solved by the end of the series, much like the structure of the novels. If we do another mini (or an ongoing or something) then that would be focused on a new case. This particular case Nancy is dealing with in our story, is something very close to her as it comes from her past – a cold case that should have been finished long ago. But she gets drawn into it again via an anonymous and slightly threatening letter. That brings her back to her hometown and into the thick of a case that is not quite what it seems on first look. DW: You have done a lot of superhero comics, how is it you’ve ended up working on a detective series like Nancy Drew? How did all of this come together? KT: Well, even though I’ve done quite a bit of superhero comics I’ve also done quite a bit of detective stuff – Hawkeye is of course one part superhero story, one part detective story, and my creator-owned comic Mega Princess (with artist Brianne Drouhard) is an all-ages take on a princess with super powers who wants to be a detective. There are also detective elements – albeit less traditional ones – to my first creator-owned OGN with artist Meredith McClaren – Heart in a Box. So I’m no stranger to it. In fact, it’s probably my favorite genre. And mixing it (and subverting it) with other genres is also a favorite. DW: What is the creative process like working with Jenn St-Onge? What is it about her at that made her the right choice for the series? Is there anything you’ve seen in the pages so far that you think fans are going to be excited for when they see? KT: Jenn and I work very well together… at least from my perspective! She’s a wonderful collaborator, full of excellent ideas. She’s a writer’s dream in that she can do basically anything you ask for and nine times out of ten, make it better than you had imagined. As for process, we’re pretty in sync at this point and so we don’t have a LOT of back and forth. I trust her and her instincts are always on point. When she sends in her pages for review it’s almost always just me and our editor Nate stumbling all over ourselves praising them. I think for this book she’s really leveled up when it comes to detail and world building. Her backgrounds and the way she’s anchoring her characters in their world feels better than ever. And her character work – designs, expressions, body language is all incredible. I think Jenn is perfect for Nancy Drew because she can handle all the big emotional moments you need but she also brings a lightness that is wonderfully refreshing. I’d say Jenn’s work plus Triona Farrell’s lush colors and Ariana Maher’s deft lettering is a gorgeous package. 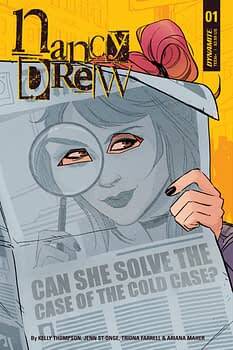 DW: For every Nancy Drew fan there is going to be someone who has never heard of the character. In a sentence or two, how would you pitch this series to a newcomer just picking the book up off the shelf for the first time? Why should they jump into the world of Nancy Drew? KT: A preternaturally clever and resourceful young detective and her friends solve crimes while getting into trouble, falling in love, bickering, and rekindling old friendships. What’s not to love?